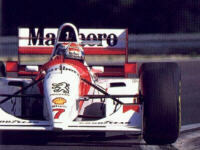 There were times when Mika Häkkinen was seen as the "Irvinator" of the field. His aggressive style, probably combined with the disappointment over the failing McLaren-Peugeot combination, got him into trouble more than once during the 1994 season. At Hockenheim he was seen to be the catalyst to a multi-car pile-up at the start after which the FIA, in trigger-happy form those days, immediately meted out a one-race ban. This meant that for the Hungarian GP McLaren had to look for a substitute. Ron Dennis didn't need to go at lengths to get himself a stand-in because his engine deal with Peugeot meant that Philippe Alliot had been forced on him as a "test driver". Alliot's F1 career was already on the rocks by then and his performance at the Hungaroring was lacklustre to say the least, his reputation as a super qualifier notwithstanding. He returned to the F1 cockpit just once more, jumping in at Spa for his long-time employer Larrousse. If Philippe must be credited for something, it must be that he managed to stay in F1 for a relatively long spell without achieving any success worth mentioning.